An easy to make, healthy, and delicious family meal. 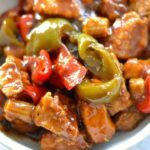 Sweet and sour flavors with chicken and lots of veggies. Cut the chicken in squares, season with a little salt and pepper and set aside. Then cut the green and red peppers into strips. In a small pot whisk soy sauce, water, and honey or maple syrup together until smooth. You can add grated ginger, minced garlic (1-2 cloves), and also a couple of tablespoons of pineapple juice if you want to add more flavor to the sauce. Those are totally optional. Cook chicken with the sauce for about 5 hours in low in the crock pot and then add the veggies. Let it cook for 45 additional minutes still in low. Finally, to thicken the sauce, first mix 1 tablespoon of cornstarch with 2 tablespoons of cold water in a small glass or container. When completely dissolved, put it in the crock pot and turn it to high for 15 minutes so it simmers and thickens. This is the last step if you want the sauce to thicken and should be done at the end (last 15 mins). You can add your veggies at the same time as the chicken but they will come out extra tender and soft (if you like that texture). Add other veggies according to your taste. Carrots, broccoli, cauliflower, and snap peas all work really well for this recipe. If you want to buy the teriyaki sauce, I like the one from Whole Foods Market. Just add 1 1/2 cups to the crock pot.